Developed for the service technician. For periodic maintenance of photocopiers, matrix printers, laser printers, computers, et cetera. 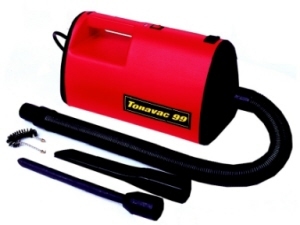 The vacuum cleaners are protected against static discharge (ESD-safe). Semi-professional version. Small, lightweight model. 0.3 micron filtering through a paperbag. Automatic shut-off (reset). Accessories: Suction hose, 3 fittings, 0.3 micron 1,7 liter filterbag, and 2 meter power cord. Esd safe. Dimensions: 320 x 175 x 146 mm. (lxwxh). Weight 2 kg. For the matching vacuum parts click here. Professional version. 0.3 micron filtration through a fleece bag. Auto-off (reset). Polypropylene housing with storage for accessories. 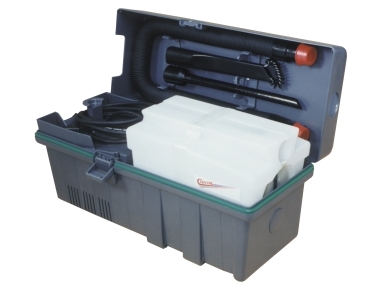 Accessories: Suction hose, 3 fittings, 0.3 micron 2,5 liter filterbag, 2.9 mtr. built-in power cord. Dimensions: 465 x 185 x 220 mm. (lxwxh). Weight 5.2 kg. For the matching vacuum parts click here. Professional version. 0.3 micron filtration through a fleece bag. Automatic shut-off (reset). 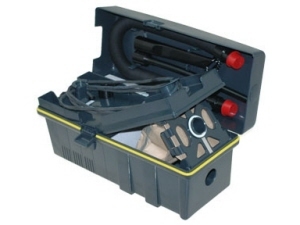 Polypropylene housing with storage for accessories. Ac-cessories: Suction hose, 3 fittings, 0.3 micron 2,5 liter filterbag, 5 mtr. built-in power cord. Dimensions: 465 x 185 x 220 mm. (lxwxh). Weight 5.2 kg. ESD wrist strap connector. Noise level is slightly lower. For the matching vacuum parts click here. Professional version. 0.12 micron filtration through a cartridge. Automatic shut-off (reset). Polypropylene housing with storage for accessories. Accessories: Suction hose, 3 fittings, 0.12 micron 4,6 liter cartridge, 2.9 meter built-in power cord. Dimensions: 465 x 185 x 220 mm. (lxwxh). Weight 5.2 kg. For the matching vacuum parts click here. Professional version. 0.12 micron filtration through a cartridge. Automatic shut-off (reset). Polypropylene housing with storage for accessories. Accessories: Suction hose, 3 fittings, 0.12 micron 4,6 liter cartridge, 5 meter built-in power cord. Dimensions: 465 x 185 x 220 mm. (lxwxh). Weight 5.2 kg. ESD wrist strap connector. Noise level is slightly lower. For the matching vacuum parts click here.